Brauneria Necker ex T.C.Porter & Britton Helichroa Raf. Echinacea /ˌɛkɪˈneɪʃiə/ is a genus, or group of herbaceous flowering plants in the daisy family. The genus Echinacea has ten species, which are commonly called coneflowers. They are found only in eastern and central North America, where they grow in moist to dry prairies and open wooded areas. They have large, showy heads of composite flowers, blooming from early to late summer. The generic name is derived from the Greek word ἐχῖνος (ekhinos), meaning "hedgehog", due to the spiny central disk. These flowering plants and their parts have different uses. Some species are cultivated in gardens for their showy flowers. Echinacea purpurea is used in folk medicine. Two of the species, E. tennesseensis and E. laevigata, are listed in the United States as endangered species. Echinacea species are herbaceous, drought-tolerant perennial plants growing up to 140 cm or 4 feet, in height. They grow from taproots, except E. purpurea, which grows from a short caudex with fibrous roots. They have erect stems that in most species are unbranched. Both the basal and cauline (stem) leaves are arranged alternately. The leaves are normally hairy with a rough texture, having uniseriate trichomes (1–4 rings of cells) but sometimes they lack hairs. The basal leaves and the lower stem leaves have petioles, and as the leaves progress up the stem the petioles often decrease in length. The leaf blades in different species may have one, three or five nerves. Some species have linear to lanceolate leaves, and others have elliptic- to ovate-shaped leaves; often the leaves decrease in size as they progress up the stems. Leaf bases gradually increase in width away from the petioles or the bases are rounded to heart shaped. Most species have leaf margins that are entire, but sometimes they are dentate or serrate. The flowers are collected together into single rounded heads at the ends of long peduncles. The inflorescences have crateriform to hemispheric shaped involucres which are 12–40 mm wide. The phyllaries, or bracts below the flower head, are persistent and number 15–50. The phyllaries are produced in a 2–4 series. The receptacles are hemispheric to conic. The paleae (chaffs on the receptacles of many Asteraceae) have orange to reddish purple ends, and are longer than the disc corollas. The paleae bases partially surrounding the cypselae, and are keeled with the apices abruptly constricted to awn-like tips. The ray florets number 8–21 and the corollas are dark purple to pale pink, white, or yellow. The tubes of the corolla are hairless or sparsely hairy, and the laminae are spreading, reflexed, or drooping in habit and linear to elliptic or obovate in shape. The abaxial faces of the laminae are glabrous or moderately hairy. The flower heads have typically 200–300 fertile, bisexual disc florets but some have more. The corollas are pinkish, greenish, reddish-purple or yellow and have tubes shorter than the throats. The pollen is normally yellow in most species, but usually white in E. pallida. The three or four-angled fruits (cypselae), are tan or bicolored with a dark brown band distally. The pappi are persistent and variously crown-shaped with 0 to 4 or more prominent teeth. x = 11. Like all members of the sunflower family, the flowering structure is a composite inflorescence, with rose-colored (rarely yellow or white) florets arranged in a prominent, somewhat cone-shaped head – "cone-shaped" because the petals of the outer ray florets tend to point downward (are reflexed) once the flower head opens, thus forming a cone. Plants are generally long lived, with distinctive flowers. The common name "cone flower" comes from the characteristic center "cone" at the center of the flower head. The generic name Echinacea is rooted in the Greek word ἐχῖνος (echinos), meaning hedgehog, it references the spiky appearance and feel of the flower heads. DNA analysis is applied to determine the number of Echinacea species, allowing clear distinctions among species based on chemical differences in root metabolites. The research concluded that of the 40 genetically diverse populations of Echinacea studied, there were ten distinct species. Echinacea products vary widely in composition. They contain different species (E. purpurea, E. angustifolia, E. pallida), different plant segments (roots, flowers, extracts), different preparations (extracts and expressed juice), and different chemical compositions which complicate understanding of a potential effect. Well-controlled clinical trials are limited and low in quality. Although there are multiple scientific reviews and meta-analyses published on the supposed immunological effects of Echinacea, significant variability of products used among studies has limited conclusions about effects and safety, consequently leading to non-approval by regulatory authorities like the United States Food and Drug Administration of any health benefit or anti-disease activity. While one 2014 systematic review found that Echinacea products are not effective to treat or prevent the common cold, a 2016 meta-analysis found tentative evidence that use of Echinacea extracts reduced the risk of repeated respiratory infections. A 2015 monograph by the European Medicines Agency stated that oral consumption of "expressed juice" or dried expressed juice of Echinacea could prevent or reduce symptoms of a common cold at its onset. As of 2017, the benefit, if any, appears to be small and thus of little utility. According to Cancer Research UK: "There is no scientific evidence to show that echinacea can help treat, prevent or cure cancer in any way. Some therapists have claimed that echinacea can help relieve side effects from cancer treatments such as chemotherapy and radiotherapy, but this has not been proven either." One study on the anxiolytic potential and psychotropic side effects of an echinacea preparation in laboratory animals and healthy volunteers was made, in which positive results (a decrease in anxiety) with small dosages (40mg/day for human consumption) were found, as well as positive results for tests on rats. When taken by mouth, Echinacea does not usually cause side effects, but may have undesirable interactions with various drugs prescribed for diseases, such as heart disease, bleeding, and autoimmune diseases, such as rheumatoid arthritis, lupus, or psoriasis. Although there are no specific case reports of drug interactions with Echinacea, safety about taking Echinacea supplements is not well-understood, with possibilities that it may cause side effects, such as nausea, stomach upset or diarrhea, and that it may have adverse reactions with other medications. One of the most extensive and systematic studies to review the safety of Echinacea products concluded that overall, "adverse events are rare, mild and reversible," with the most common symptoms being "gastrointestinal and skin-related." Such side effects include nausea, abdominal pain, diarrhea, itch, and rash. Echinacea has also been linked to allergic reactions, including asthma, shortness of breath, and one case of anaphylaxis. Muscle and joint pain has been associated with Echinacea, but it may have been caused by cold or flu symptoms for which the Echinacea products were administered. There are isolated case reports of rare and idiosyncratic reactions including thrombocytopenic purpura, leucopenia, hepatitis, kidney failure, and atrial fibrillation, although it is not clear that these were due to Echinacea itself. 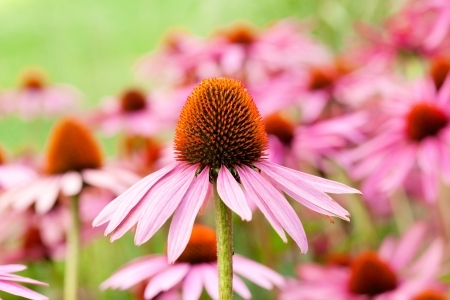 Up to 58 drugs or supplements may interact with Echinacea. As a matter of manufacturing safety, one investigation by an independent-consumer testing laboratory found that five of eleven selected retail Echinacea products failed quality testing. Four of the failing products contained levels of phenols below the potency level stated on the labels. One failing product was contaminated with lead. The European Herbal Medicinal Products Committee (HMPC) and the UK Herbal Medicines Advisory Committee (HMAC) recommended against the use of Echinacea-containing products in children under the age of 12. Manufacturers re-labelled all oral Echinacea products that had product licenses for children with a warning that they should not be given to children under 12 as a precautionary measure. Although research has not found increased risk of birth defects associated with use of Echinacea during the first trimester, it is recommended that pregnant women should avoid Echinacea products until stronger safety supporting evidence becomes available. It is recommended that women breastfeeding should use caution with Echinacea products due to insufficient safety information available. The U.S. Food and Drug Administration recommends precaution about using dietary supplements because some products may not be risk free under certain circumstances or may interact with prescription and over-the-counter medicines. As with any herbal preparation, individual doses of Echinacea may vary significantly in chemical composition. Inconsistent process control in manufactured echinacea products may involve poor inter- and intra-batch homogeneity, species or plant part differences, variable extraction methods, and contamination or adulteration with other products, leading to potential for substantial product variability. Some species of Echinacea, notably E. purpurea, E. angustifolia, and E. pallida, are grown as ornamental plants in gardens. Many cultivars exist, and many of them are asexually propagated to keep them true to type. Echinacea extracts inhibited growth of three species of trypanosomatids: Leishmania donovani, Leishmania major, and Trypanosoma brucei. Echinacea angustifolia was widely used by the North American Plains Indians for its supposed medicinal qualities. According to Wallace Sampson, its modern use for the common cold began when a Swiss herbal supplement maker was "erroneously told" that Echinacea was used for cold prevention by Native American tribes who lived in the area of South Dakota. Although Native American tribes did not use Echinacea for the common cold, some Plains tribes did use echinacea for cold symptoms. The Kiowa used it for coughs and sore throats, the Cheyenne for sore throats, the Pawnee for headaches, and many tribes including the Lakota used it as a pain medication.